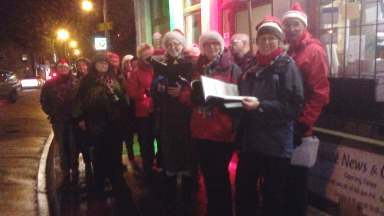 Silsden singers is a community choir. We meet on Tuesdays evenings in term-time, at the Hive (formerly the called Youth Centre in the Daisy Chain Children's Centre). Despite the change of name, it is still next to the Fire Station in Elliott Street, Silsden, in the westernmost part of West Yorkshire. 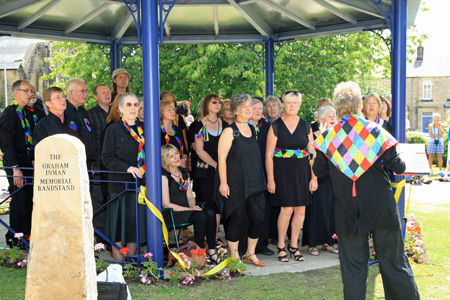 Silsden Singers is a mixed choir with around 40 members. We are open to all adults who want to have fun, singing in harmony with others. No auditions, all welcome. Sing in your natural voice amongst a friendly bunch of people. We sometimes meet up with other of Janet's choirs. The first choir meetup of 2019 involves four choirs: the fourth, the Peace Through Folk Choir, was started by Janet but it is too far for her to lead it regularly. In March 2018 we shared a few songs with other choirs. This is a recording of us singing one of them. Just recorded on a phone, nothing special, no rehearsal. Settle Voices, East Lancs Clarion Choir and Silsden Singers. Together! These examples are from a 2009 performance by Silsden Singers in Kirby Malham church. Silsden Singers was founded by Janet Russell all those years ago, and she leads the choir today. Janet is an inspiring and experienced choir leader, who also performs regularly on the national Folk Music circuit, both as a soloist and with other singers. She has worked with Jigjaw and Sisters Unlimited.